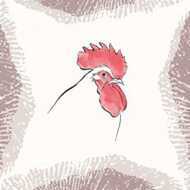 Bullion makes his return with ‘Rooster’, a mini album of free range funk set in a musical barnyard. From the world outside your window, Rooster jigs a jig and chants a chant, fizzes up in the Far East on ‘Saysah!’ and pops itself back in England (with a vocal feature from ESKA) on ‘Pull Your Rug Away’. Whichever came first, chicken and egg bind together and the yolk is rich!